We hit the client jackpot when we got an email back in 2016 from an awesome young couple, Emma and Ian. 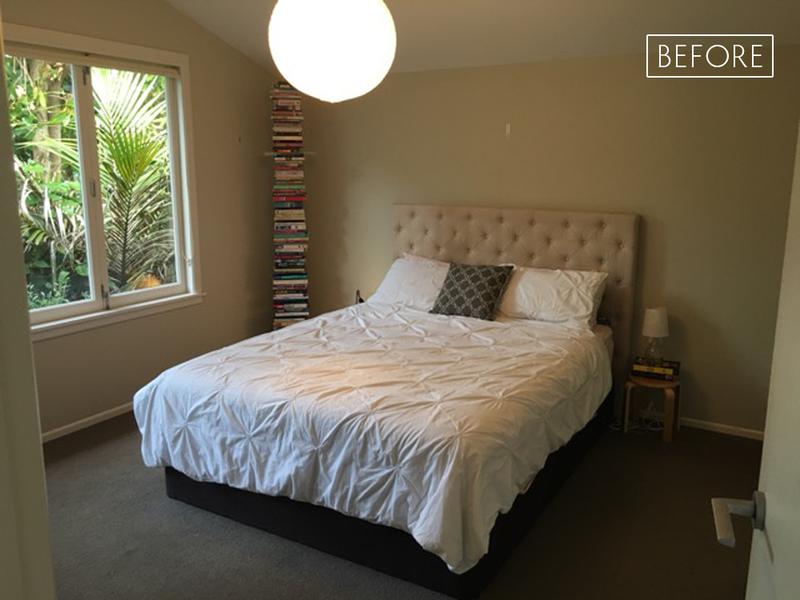 They had just bought a new family home in Belmont, Auckland that they felt had great bones but lacked personality, and they wanted our help. Of course we love these kind of projects, as we relish any opportunity to bring a home to life and help it to reflect the people that live there. 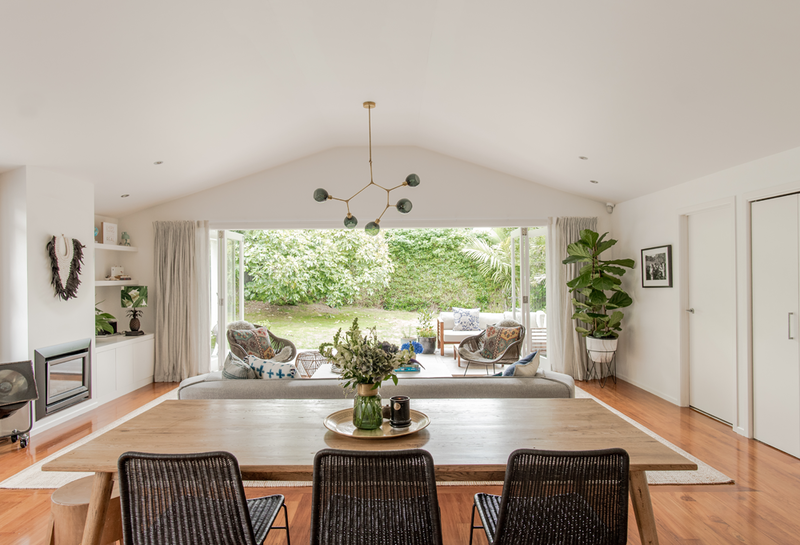 Emma and Ian had only some very minor structural renovations in mind, but wanted nearly a full fit-out of new furniture, window treatments and accessories. 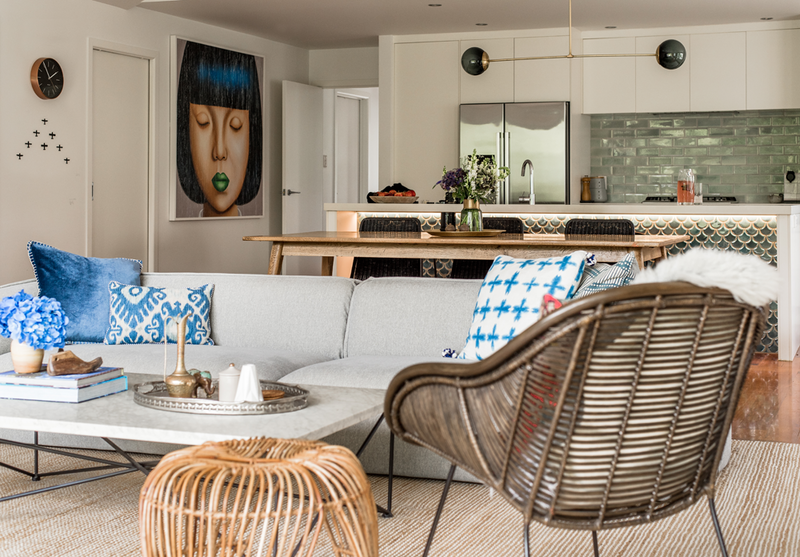 Their brief was to create a home that had a holiday vibe - "a sub tropical deluxe retreat with an edge" were Emma's exact words. The back of the house is beautiful, light and airy with a high vaulted ceiling and large french doors opening out onto the back lawn. It contains the kitchen, dining area, and a living room which was zoned by a rectangular piece of in-laid carpet. A coat of fresh, white paint, and swapping the roller blinds out for beautiful linen curtains created a timeless base to work with. The curtains add a softness, and when pulled the gentle folds add lovely texture to the room. 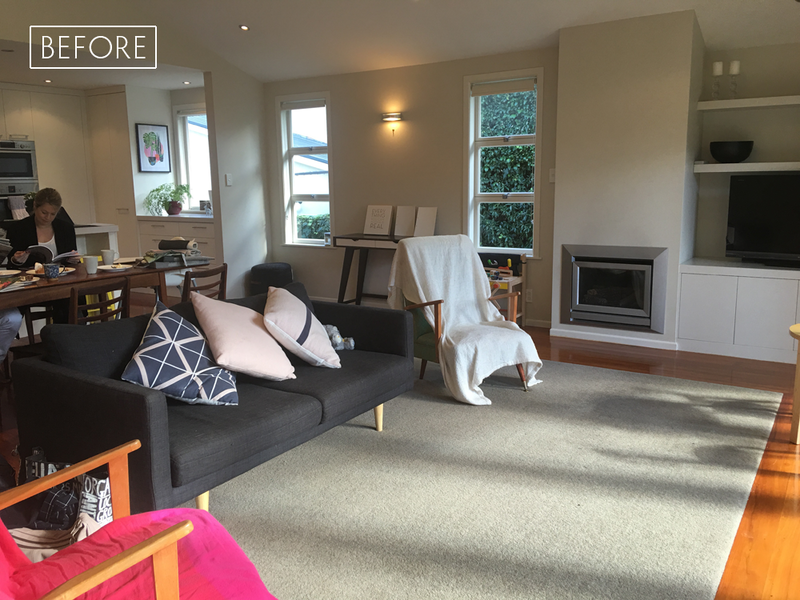 Removing the carpet and replacing the floorboards was a rather costly option, so we got a rug custom made to cover the carpet, and because it was a bit larger, it gave the living area a bit more breathing room. The beautiful large chandelier also helps to zone the living room in the open plan space. We chose a large four seater sofa that can withstand a couple of boisterous (and adorable) young children, it's super comfy and very cool - for that edginess that Emma wanted. It's long and low profile hunkers down into the room allowing the view outside to be accessible from throughout the room, and the back creates a clear divide between the living and dining areas. To fit the space between the kitchen and living area, the dining table is long and narrow. 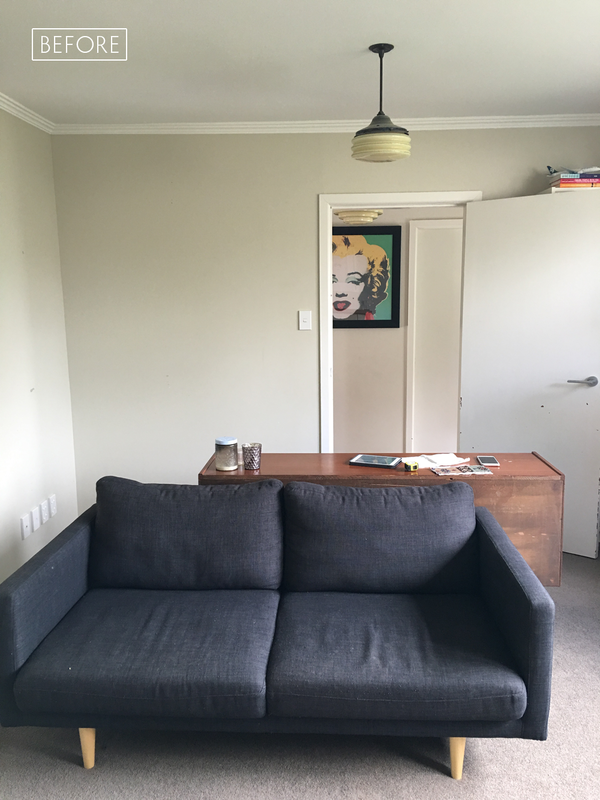 We used a bench seat on one side, which is perfect for kids, and it helps to keep it from looking cluttered - which is key in an open plan room. When not in use it can tuck under the table discreetly. Roman blinds in a blue and white batik fabric replaced the original roller blinds. The wall between the two smaller windows was a great spot for some art, so the wall light was removed and we anchored the large print with the wooden bench below. We kept the colour palette to shades of blue, green and white to create the tropical feel, with wood and brass accents for warmth. We also wanted to reflect Emma and Ian's love of travel by using pieces they've collected over the years, and by introducing new pieces with a global influence. 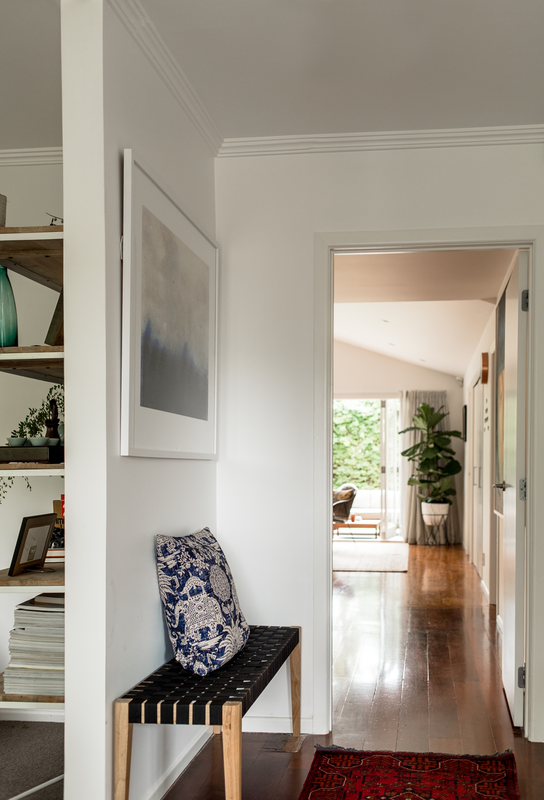 The large stool in the corner is a vintage Indian grinder table picked up in Hawke's Bay when we took the couple shopping in some of our favourite shops. 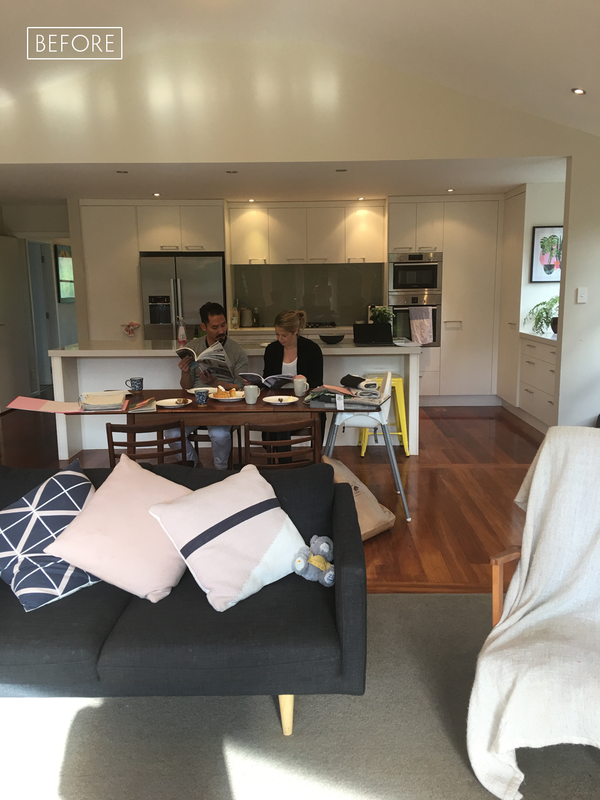 The kitchen was quite new and Emma and Ian didn't feel the need to replace it, so we had some simple solutions to help them update it. The original kitchen had a lot of silver handles everywhere. We replaced the ones on the lower cabinets with the same size handle but in a beautiful matt black. The upper cabinets had their handles completely removed and a push-to-open mechanism was installed inside, giving a cleaner, more contemporary look. The light over the breakfast bar echoes the one in the living area and helps to zone the kitchen area. We replaced the painted glass splash back with gorgeous soft green subway tiles to add texture and interest. 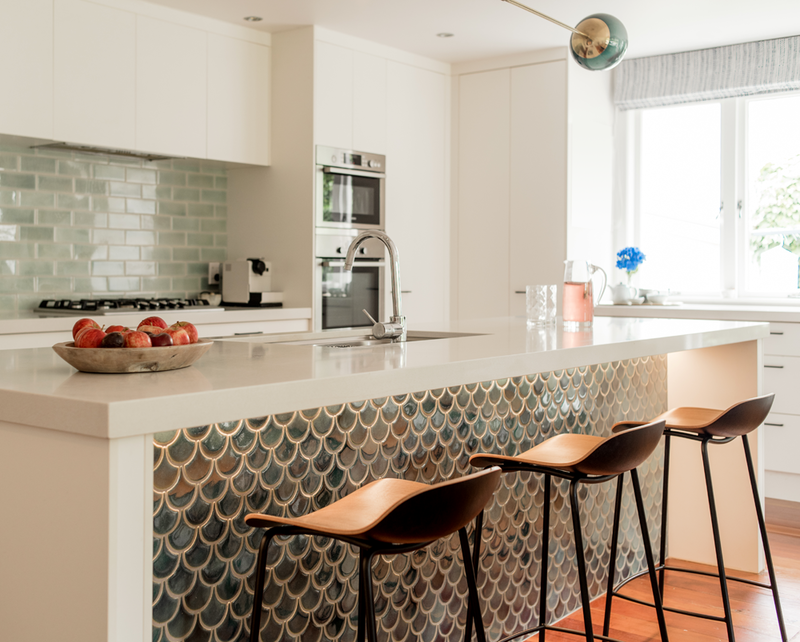 For another layer the scallop tiles were added to the front of the breakfast bar. They compliment the subway tiles beautifully and continue the tropical holiday vibe without being too literal. A strip of LED lighting runs along under the bench to subtly highlight the tiles. The bar stools are low in profile so they can also tuck away when not in use, keeping the look unfussy. Emma and Ian picked up the 'lady with the green lips' while they were in Bali, and she works so well in this space. We commissioned the small resin planes from Michele Bryant, each has an international destination on it - cities or provinces that Ian has worked with Air New Zealand. We chose the large marble and metal coffee table for it's scale as we wanted a piece big enough to work with the sofa. A pair of rattan armchairs face the sofa and can also be pulled outside for extra seating when needed. The master bedroom is off the living room and has large bi-fold windows that open onto the back garden. We wanted the room to have a sophisticated holiday vibe, and to be a place of calm and quiet for Emma and Ian to retreat to. We chose a deep teal blue for the walls, fresh white linen bedding and a quilted blue throw to ground the end of the bed. We had the green velvet headboard custom made, and also made the pink & gold cushion and bedside lampshades specially. The palm tree lamp bases, scalloped bedside tables, and fish trap pendant light all continue the tropical theme. The light oak drawers compliment the blue walls and pick up the tones in the artwork by Chris Sisarich. The bathrooms were similar to the kitchen - Emma and Ian chose not to completely replace the fittings and fixtures, but instead to simply 'zshush' them up. 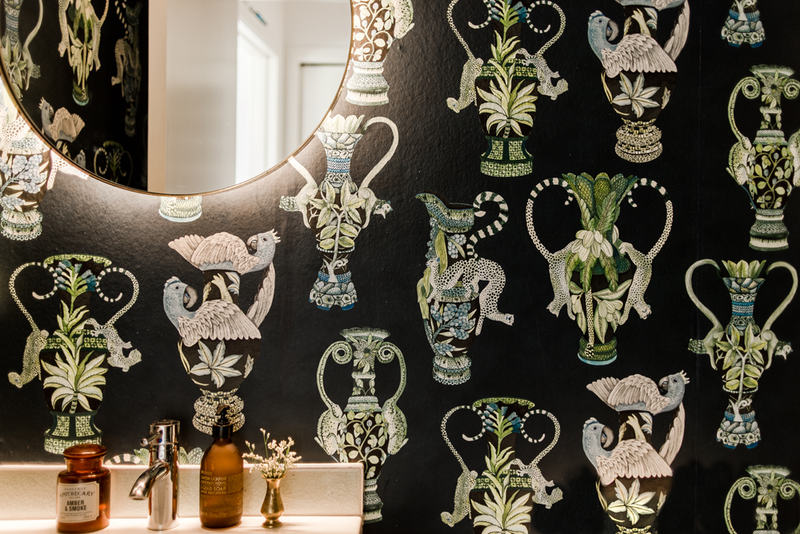 The shell mirror was bought on Emma and Ian's shopping trip with us in Hawke's Bay, and it instantly updates the room. The walls were freshened up again with a bright white, and we bought a little rustic wooden stool in to add some warmth and texture. 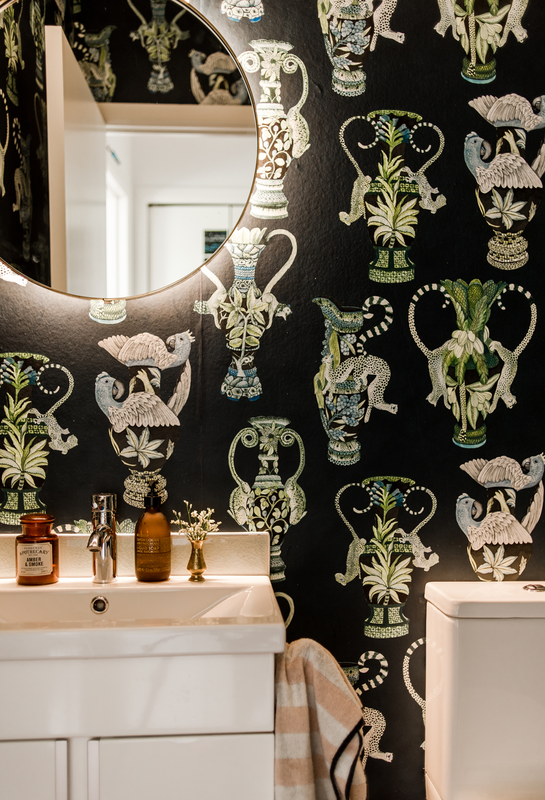 The seperate toilet room got a similar treatment with the mirror replaced and some beautiful wallpaper added. Little touches like a colourful hand towel and pretty soaps are so simple to add and can make all the difference. Blake and Isla share a bedroom and Emma wanted us to give it a whimsical, playful makeover. We defined each child's side of the room with their own wallpaper. Blake's is blue and white with a striped linen duvet and denim pillowcase. Isla's side of the room is in soft peaches and dusty pinks, and her wallpaper has the same sense of whimsy as her brother's but in a much more girly way. The front living room was lacking the natural light that the main living space had, so we removed the door frame and opened it right up, replacing the door with an internal slider. The walls were painted and the furniture was updated. A pair of vintage armchairs were screaming out for some love, so we recovered them in one of our favourite kilim fabrics giving them that global vibe we love so much. The linen slipcover sofa is another favourite of ours and perfect for a family with kids. All of the covers can be easily removed and thrown in the wash whenever necessary. The larger door opening lets in much more light during the day, and can be closed up in the evenings if the kids are sleeping. The entranceway was another area that just needed tweaking. The little built-in box was removed and replaced with a bench seat. A piece of art was hung above it and an antique runner was introduced to lead you down into the heart of the home.